I have a problem: I can't bear to throw away stuffed animals, no matter how dingy, unloved or frightening they may be. Somehow my two kids have amassed a ton of the little critters and they are split between two bedrooms in an egalitarian jumble of cuddly dust. Some of them are actually washable but most of them read "surface wash only- wipe with damp sponge" which is not a particularly effective solution, especially if anyone in your home has allergies. And you're a mediocre housekeeper. And you have six cats. Aaah-chooo!!! Clorox Anywhere Anti-Allergen Fabric Spray can actually change the structure of allergen proteins, neutralizing up to 90% of common indoor allergens, including dust mites and cat/dog dander. 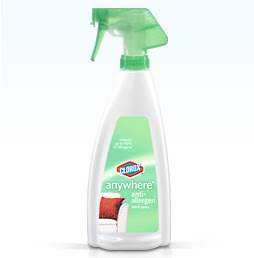 Clorox Anywhere Anti-Allergen Fabric Spray is safe and gentle enough to use around kids and pets. Its formula is fragrance-free and dye-free and may be used on upholstery and fabrics throughout the house, although it's not recommended on fabrics that are prone to water spotting such as leather, wool, silk and mohair.